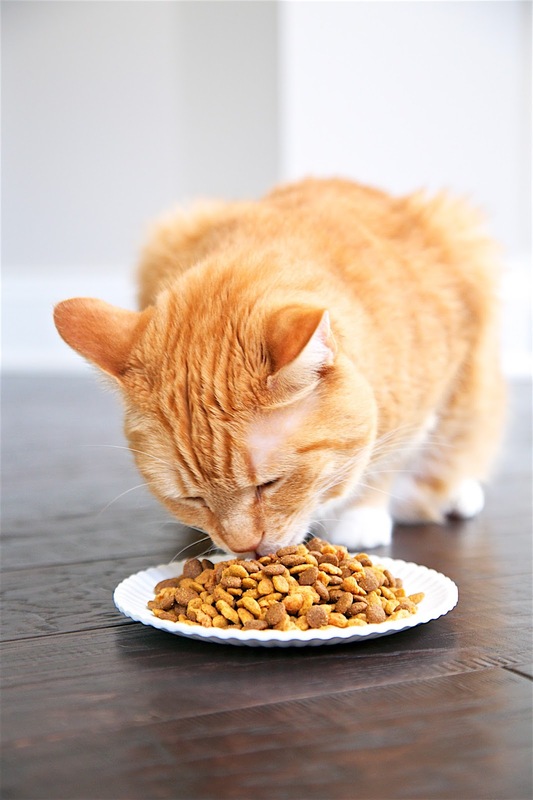 Did you know: Cats desire different texture varieties in their diet? 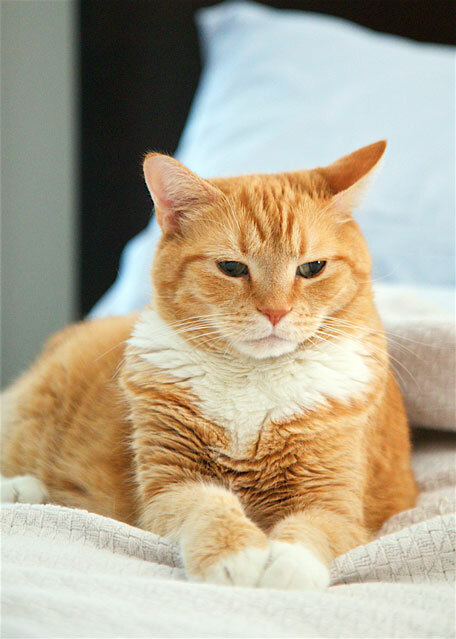 I want to ensure Jack, Squeaky, and Fluffy get the balanced nutrition they need every day for Whole Body Health. 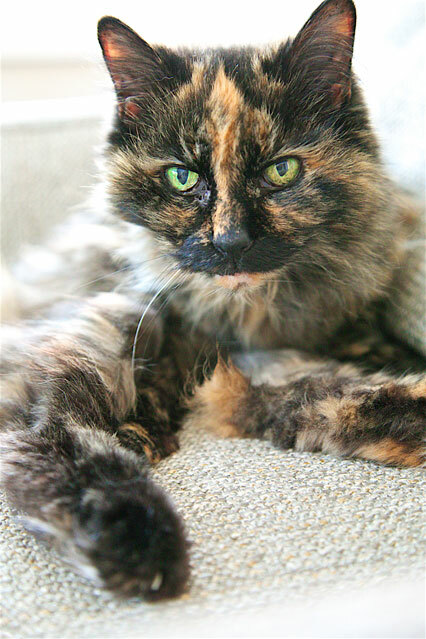 This week, I started feeding the kitties Tender Selects Blend With Real Chicken, a brand-new food from Purina ONE that provides texture variety in one unique formula. 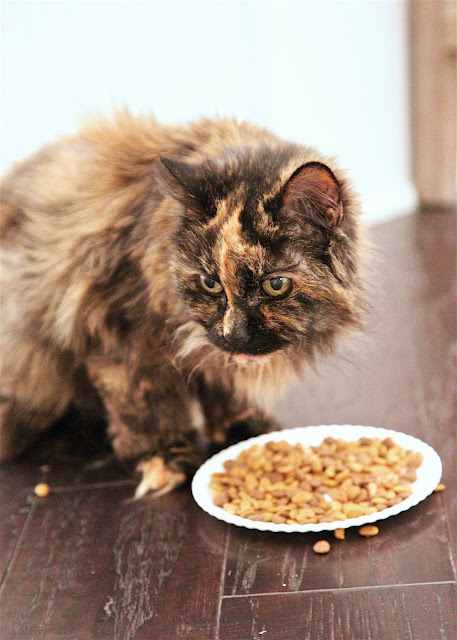 I want to ensure the cats are eager to eat, are getting the nutrition they need, and see how texture variety played a role in their daily appetite - especially my picky eater, Fluffy. At our house, we feed our cats their recommended daily allowance based on their unique body conditions. 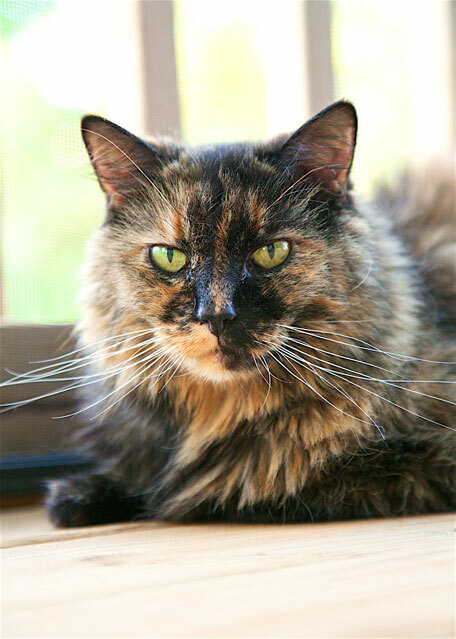 Squeaky likes to eat in the laundry room, while the other cats prefer their mealtimes on the nightstand in the bedroom! 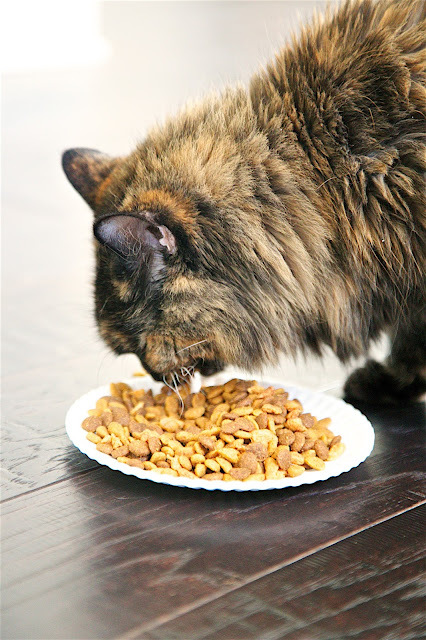 Purina ONE Tender Selects Blend With Real Chicken provides both crunchy bites and meaty, tender morsels to nourish their desire for variety in their daily diet. I set out the new bowl of food and waited to get the cats reactions. Squeaky was the first one to dig in. I knew she would be the first one, she can't resist a fresh bowl of food. She dove right in and LOVED it! She didn't waste any of the yummy food. She even ate the pieces that fell on the floor. Next up was Fluffy. I was really worried about her reaction. She is SO picky. I rarely see her eat dry food, and I struggle to find food she enjoys. Much to my surprise, she ate it and appeared to really enjoy it! She especially loved the tender meaty morsels. WIN WIN!! He dove right in and really loved it! He couldn't get enough of the delicious crunchy pieces. Woohoo!! I am ecstatic that I found a dry food that all three cats love! 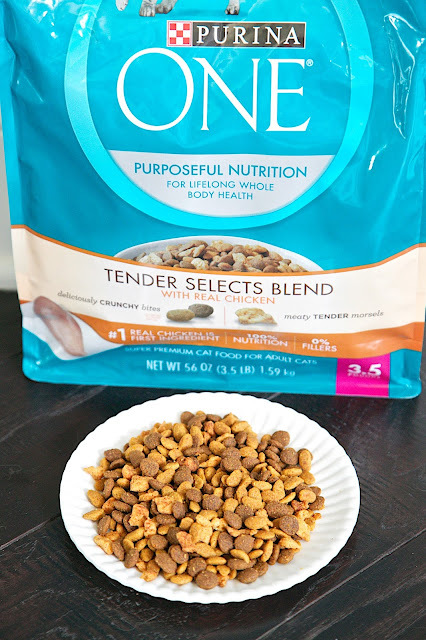 I am also ecstatic that with Purina ONE Tender Selects Blend With Real Chicken they are getting the balanced nutrition they need for Whole Body Health. After the cats ate, they all went to their favorite spots to relax. Fluffy went to take a nap in Chicken Leg's new chair, Jack went outside to sit in his catnip and Squeaky took a nap under the ottoman. 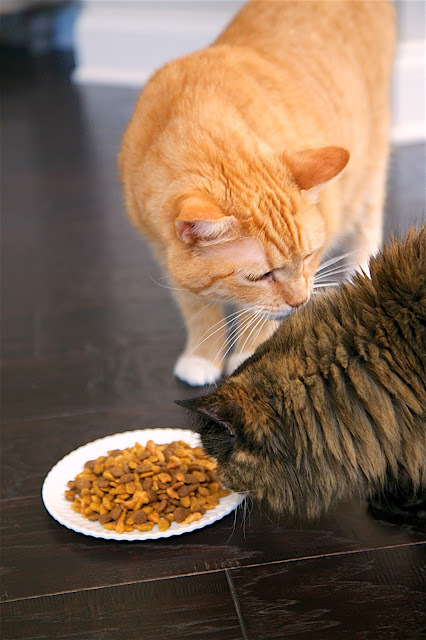 Purina ONE Tender Selects Blend With Real Chicken contains 100% nutrition and 0% fillers for adult cats. 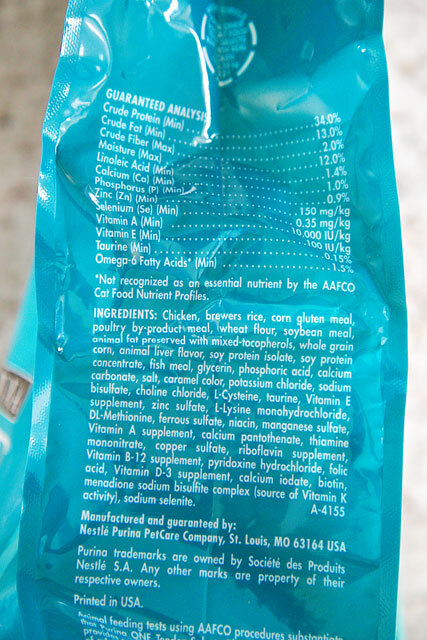 That means that all of the high quality ingredients have a purpose. I feel good about feeding the kitties this food!